Three distinct personalities, one goal: reach the moon. Neil Armstrong was the first to know. Deke Slayton, the head of NASA’s astronaut office, had pulled him aside in mission control on December 23, 1968, during the flight of Apollo 8, and asked him to command the first moon landing mission—or rather, the first attempt. There was no guarantee of succeeding on the first try. Less than two weeks later, on January 4, Slayton called Buzz Aldrin and Michael Collins into his office, where Armstrong was waiting, and informed them that they were the prime crew for Apollo 11. Armstrong (center, above) would command the mission, Aldrin (left) would be the lunar module pilot, and Collins would be the command module pilot. All three had flown on Gemini missions less than three years earlier. Collins later coined the term “amiable strangers” for the Apollo 11 astronauts, noting that other crews had seemed to bond more readily than this one. The photo above was taken on January 10, 1969, a day after NASA announced that the three men would make the first lunar landing. See the photo gallery below for more scenes from the weeks leading up to their July 16, 1969 launch. The crews of Apollo 10 and 11 huddle on June 3, 1969, shortly after the Apollo 10 mission took the lunar module on a dress-rehearsal flight to within 50,000 feet of the moon’s surface. 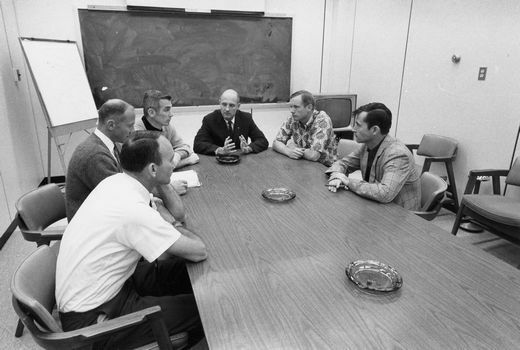 Clockwise from left: Mike Collins and Buzz Aldrin, Apollo 10 lunar module pilot Gene Cernan, Apollo 10 commander Tom Stafford, Neil Armstrong, and Apollo 10 command module pilot John Young.